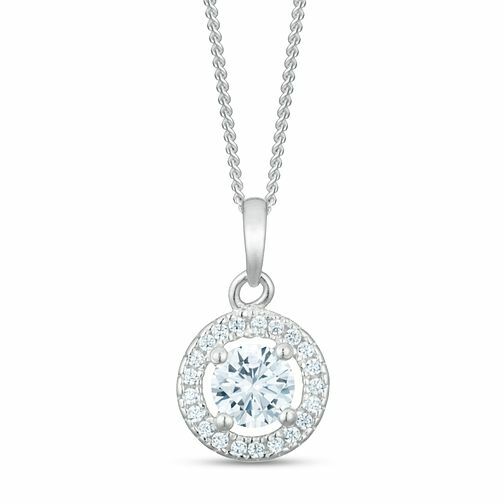 Add sparkle and class to your look with this sterling silver round pendant. Set with a single round cut cubic zirconia stone in its centre - surrounded by a halo of cubic zirconia stones - this gorgeous pendant will add a sophisticated and glamorous style to your look and help you share your true personal self with the world. Sterling Silver Cubic Zirconia Round Pendant is rated 5.0 out of 5 by 2. Rated 5 out of 5 by Anonymous from Lovely necklade Brought as a gift for mothers day, she absolutely loved it. The necklace looks amazing and very good value. Rated 5 out of 5 by Anonymous from Elegant, yet simple and an amazing affordable gift! This cute necklace is extremely shiny and stands out matches practically anything!